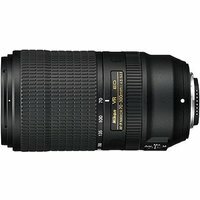 Nikon has launched a new telephoto zoom lens with some great features for sports, wildlife, and travel photographers. It is full frame compatible with a zoom range of 70-300 mm, and its minimum focus distance is maintained at 1.2 m throughout the range. Sports Vibration Reduction minimises camera shake and autofocus is swift and quiet with the Nikon Stepping Motor.